Please book online by selecting “Lodging” (with an option to add a rafting trip) or simply select “Rafting” to book your rafting-only adventure. To receive the “Stay & Ride” discount, lodging and rafting must be booked in one transaction at the time of booking. Discounts will not apply if booked separately. If you need additional help, or requesting a booking less than 24 hour of your specified date, please contact us at 902-758-8433 (TIDE) or fill in the contact form below with your question. Online bookings will receive a booking confirmation email within 24 hours. 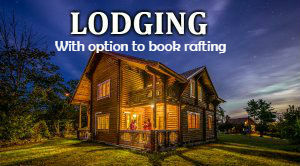 To book your accommodation (with an option to add a rafting trip) please select the “Lodging” image. 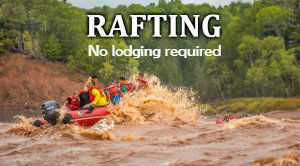 To book rafting with no accommodation, please select the “Rafting” image. To receive the “Stay & Ride” discount, accommodation and rafting must be booked in one transaction. When booking online, and a conflict occurs, alternate dates/times will be suggested. Before you make a reservation, you should look at our tour schedule and review our rafting rates. A 50% deposit is required to hold any reservation, (VISA and MasterCard are accepted). If you make an online booking, you will receive an email to confirm your reservation and deposit. Note that deposits for large groups may be made by credit card, cheque or EFT, (cheques and money orders should be mailed to: 12215 Highway 215, Urbania, Nova Scotia Canada, B0N 2H0).